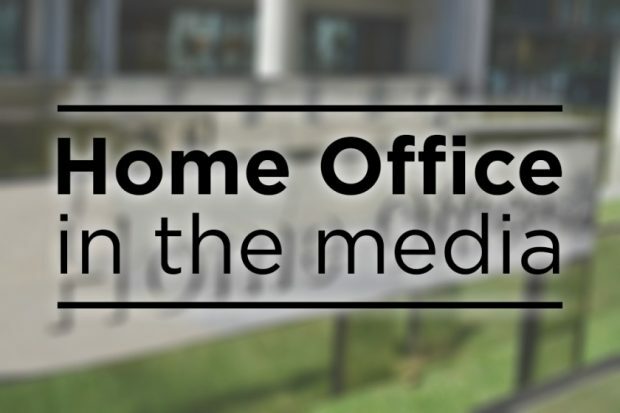 Today's Home Office stories include the Home Secretary's speech on serious violence, firearms legislation, and the one year anniversary of Windrush. There is widespread reporting of the Home Secretary’s speech yesterday in which he said he could have ended up as a criminal after growing up on the “most dangerous street in Britain”. The papers report that the Home Secretary said his parents steered him away from a life of crime and that despite being Home Secretary he still fears for his children’s safety. The coverage notes he blamed alcohol abuse and a changing drugs market, among other factors, for the rise in violence in the UK, accusing middle-class drug users of sharing some responsibility in what the Mail says is his first major speech on violent crime. Outlining his plans on how to tackle crime, the Home Secretary said knife crime should be treated like the outbreak of a "virulent disease". The Express notes Mr Javid’s “enthusiastic defence” of stop and search as a tactic to tackle violent crime. The Express’s leader is supportive of the speech and the Home Secretary who they say has “risen from tough circumstances” after growing up in Bristol. Read the Home Secretary's full speech on tackling violent crime here. The Home Secretary is accused in the Times of having 'ignored' police warning of a loophole in firearms legislation, which could allow criminals and terrorists to get hold of weapons. Police firearms experts have expressed alarm about "gaps in legislation" after the murders last month of 50 people in New Zealand, the paper reports. The Times reports that sales of powerful guns, some of which are designed to look like AK47 assault rifles, have surged in the UK because they are cheaper than traditional shotguns and popular with participants shooting at targets in obstacle courses. The paper said campaigners had called for the repeal of an exemption that allows owners of miniature-rifle ranges to acquire .22 semi-automatic rifles and large amounts of ammunition without a firearms certificate or consulting police. The UK already has some of the toughest gun laws in the world and we keep firearms licensing under constant review to safeguard against abuse and to ensure the public’s safety. The Offensive Weapons Bill, which awaits Royal Assent, addresses key issues that present a risk to public safety. Under section 11(4) of the Firearms Act 1968, a person is able to run a rifle range or shooting gallery where only miniature rifles not exceeding .23 inch calibre or air weapons are used without the need for a firearms licence. Following discussions with law enforcement agencies we are exploring options for a forthcoming formal consultation on firearms safety which is likely to consider the issue. The Guardian and Independent both carry articles marking the anniversary of Windrush. The Guardian claims that a year on the Home Office is 'still failing' Windrush citizens who many say remain in financial difficulties and have seen no change in Government policy. The paper says despite a concerted official effort to clear up Windrush-related problems, charities helping those impacted continue to have to fight to get people’s situation resolved. The Guardian goes on to report that immigration lawyers say they have seen no evidence the department has become more compassionate when dealing with cases. The Home Secretary and Immigration Minister have been resolute in their determination to right the wrongs experienced by the Windrush generation. The Windrush Taskforce, which considers applications to the scheme and the hardship fund, aims to provide a decision to applicants as soon as they are able. However, some cases are more complex than others and it is right that we take the time to ensure these are dealt with properly. In all cases we communicate with applicants to acknowledge their applications and to discuss them in detail.